Boy I've been stressed out for the past 24 hours. 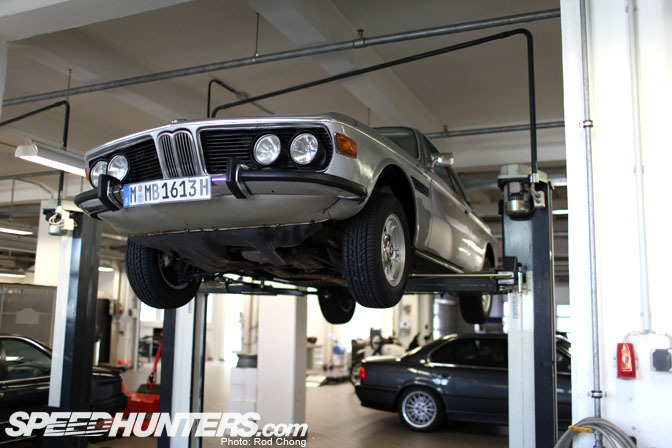 The site went down on the last day of BMW month, meaning we couldn't get the final set of stories published. We were saving some of the best pieces for last it's been a bit painful to say the least. 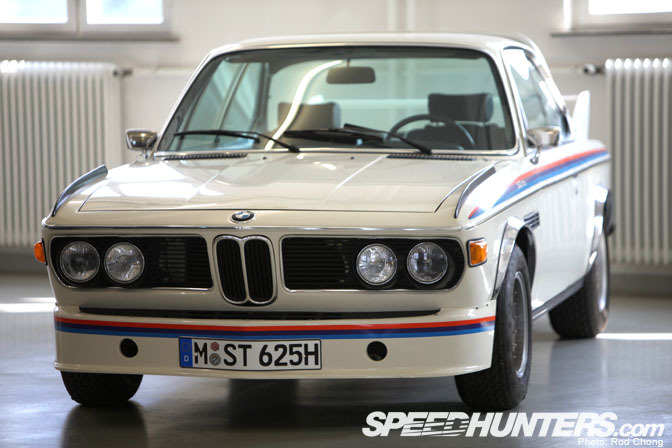 So I hope you don't mind that we quickly published the last set of stories from BMW month today. role in the international club scene." 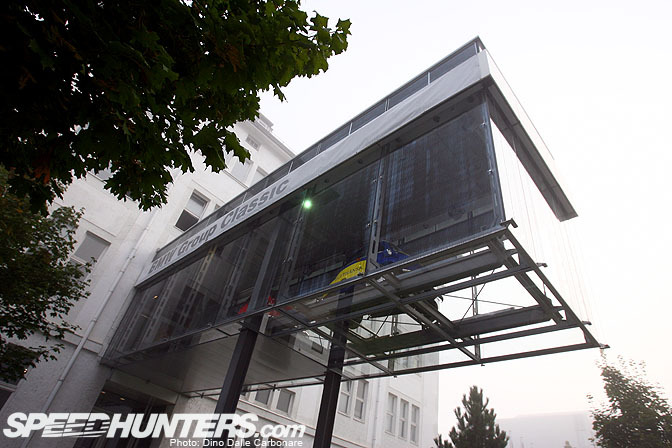 In addition to this role they also house a big collection of around 400 race and production cars and motorcycles at their HQ in Munich. It was this collection that we wanted to Speedhunt with our cameras. 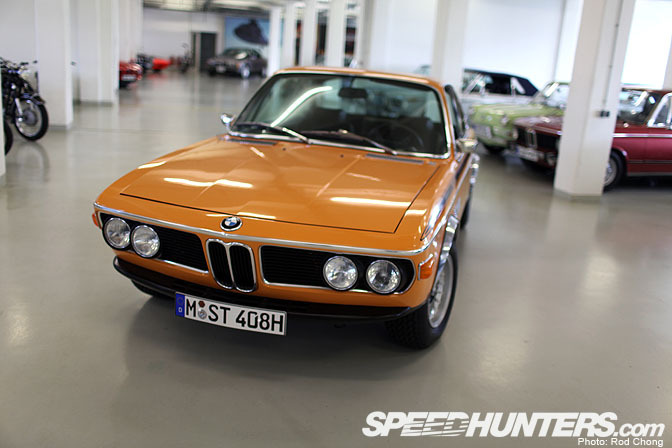 As I've never seen documentation of the BMW Group Classic Collection, I wasn't really sure what to expect. 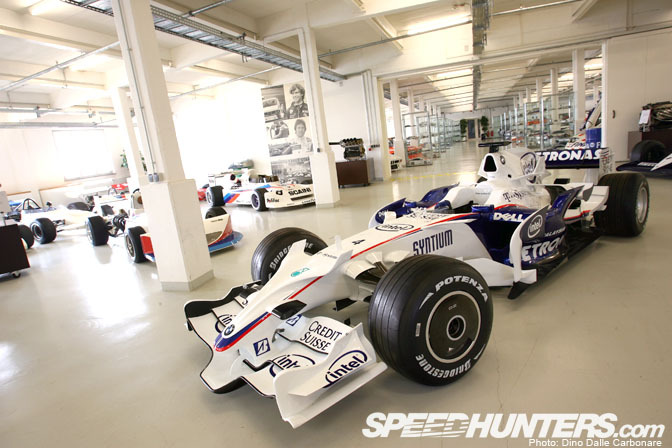 It's hard to imagine what a warehouse of 400 cars and motorcycles is going to look like, but we sure weren't disappointed… It anything, it was a bit overwhelming to have open access to such a big collection of priceless machinery. We got to tour three of the floors in the building. One is for all the race machines, the next houses all the production cars & bikes and the last is a reception area, banquet hall and restoration shop. So let's start the tour! 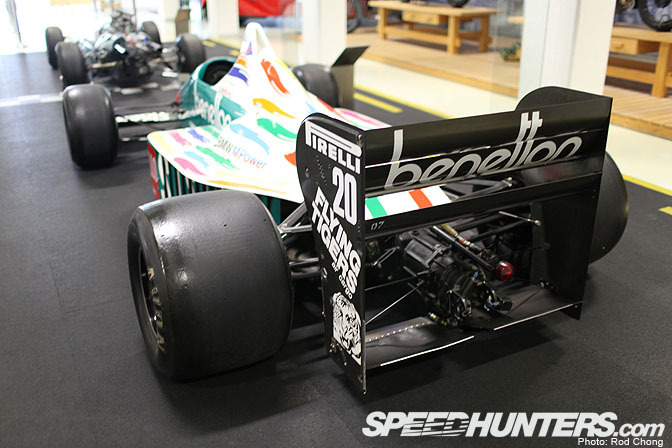 I don't have enough space here to show you all the cars, but instead will feature the ones which I think you'll be interested in… and the one's which caught my eye. 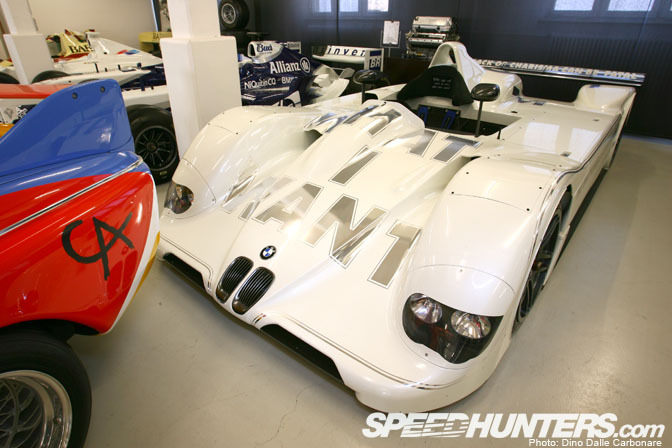 Andy Priaulx hasn't been driving for BMW that long, but he certainly has helped create some valuable chassis since he started! Here we have two ETCC and WTCC winning cars lined up together. 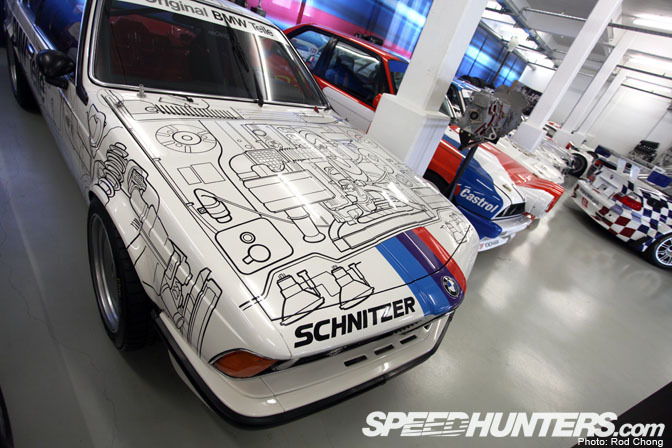 Every era of touring car is present in the collection including this old DTM Schnitzer racer from the time when the series was based on production cars. 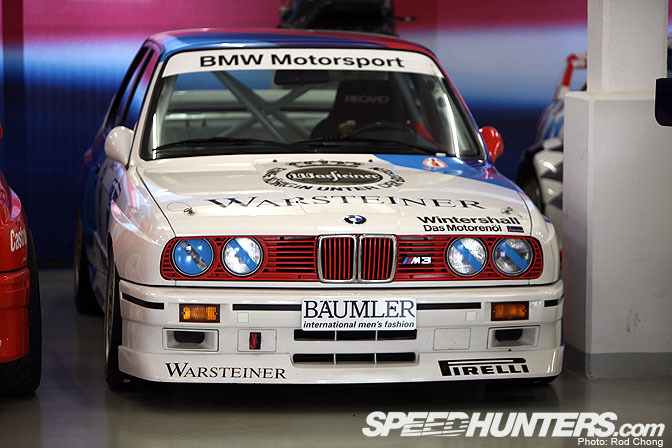 Here's the reason we have the M3 –it was originally designed to be a homologation special for Group A touring car racing around the world. Race car first, production car second! 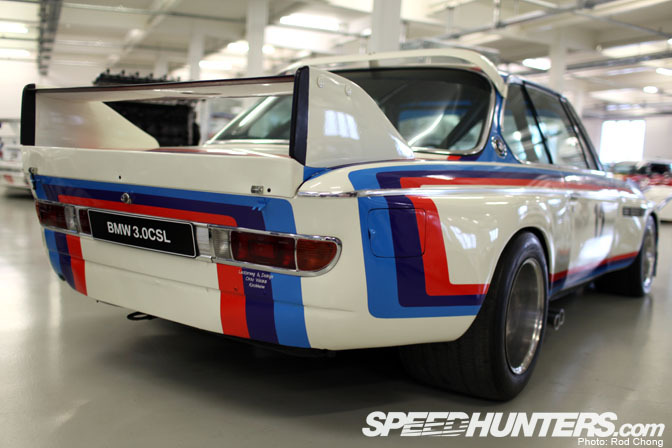 I've previously shown you a picture of the original CSL race car prototype, but there's no hurt in showing another is there? This picture shows just how low and wide ALMS M3 GTR is. .. 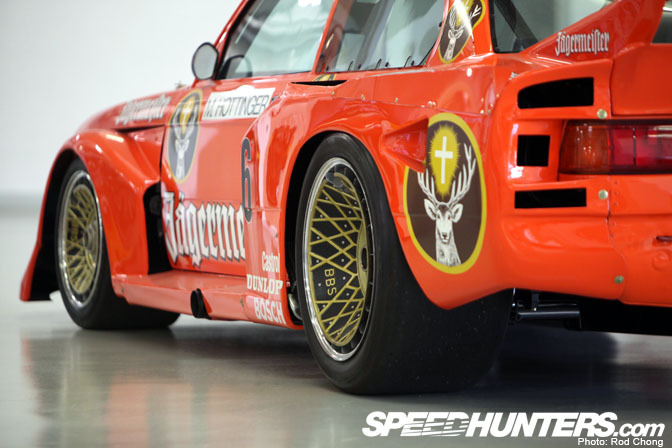 The F1 GTR Long Tail. For me this is perfection on wheels, especially when you factor in the wailing sound which bellows from its powerful V12 engine. 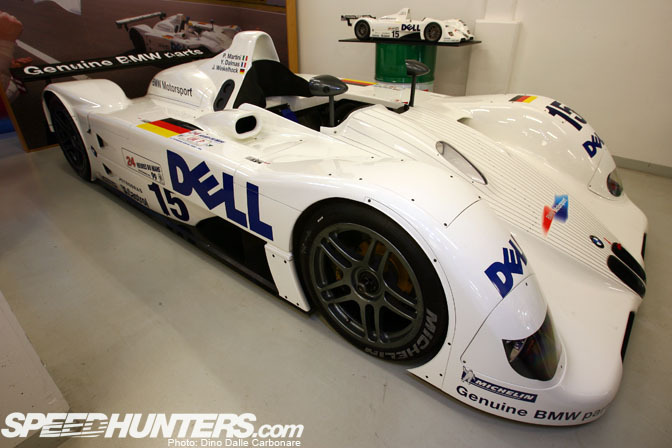 Speaking of wailing V12s here's the winner of the 1999 Le Mans 24 Hours…. complete with mini-me edition. I was curious about this model as it looks like a late Group C 3.5L mockup. Obviously this race program was still-born. Does anyone know what this it? Our host at the BMW Group Classic wasn't sure. 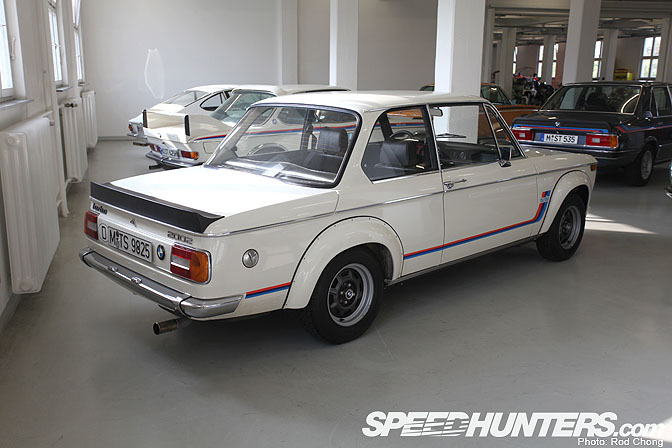 There are plenty of minor league race BMWs too, like this old Interseries sports racer. 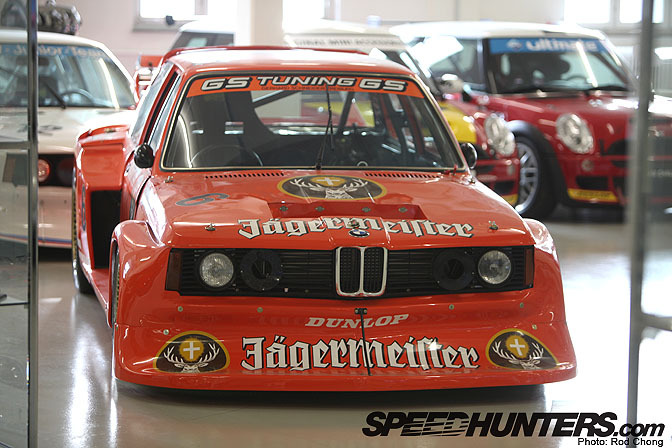 Of course my eye was immediately drawn to the Group 5 Jagermeister 320 Turbo. Which has the CORRECT 19 inch rear wheel! This is old race rubber though, as the tires are not available new anymore. A couple of Group 4 M1s sit close by. This one was sponsored by the city of Munich. 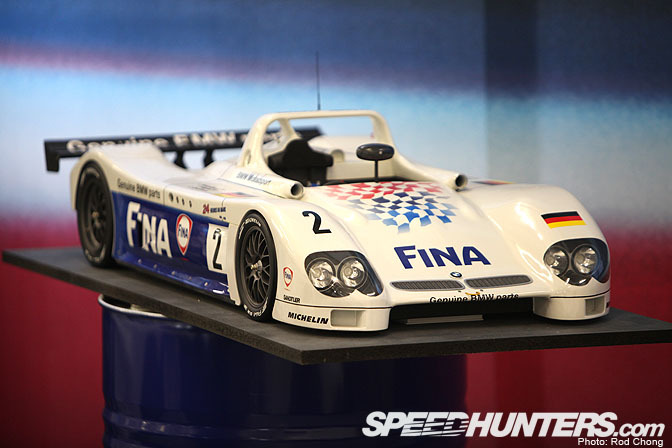 Hey another racer that I used to have as an A/FX slot car! Speaking of miniatures. There were cabinet after cabinet filled with all manner of die casts. Some of the models also appear to be one-off custom items too. 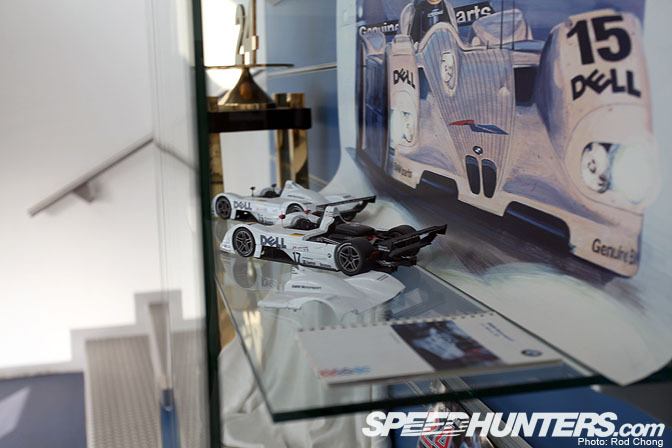 There was practically a miniature of every single race car from the collection present. 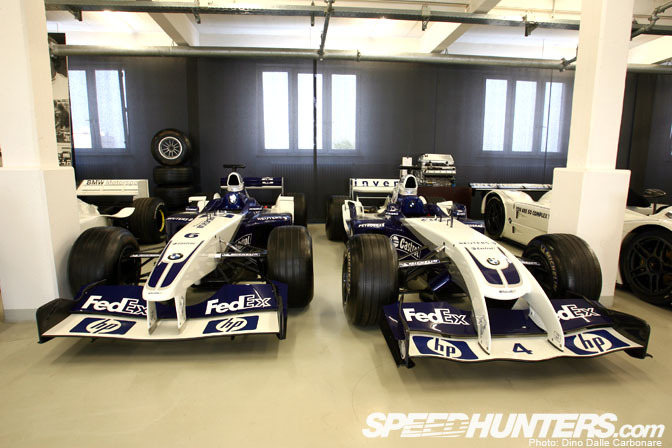 … With an assortment of F1 cars facing them. 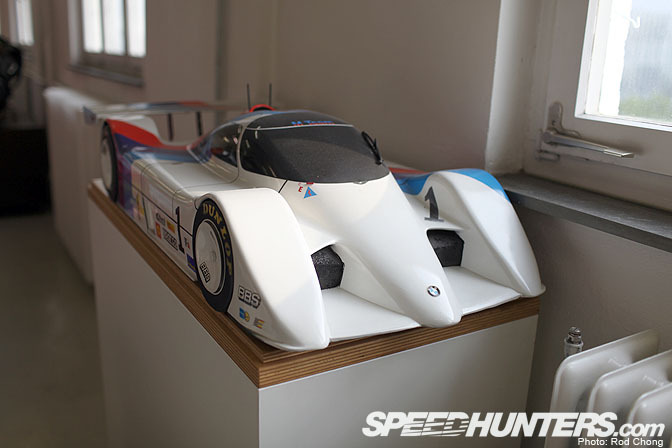 … Including the LMR sports car. On an aside… for the last ten years I've always thought the words on this Art Car were done in Blue, not Chrome. 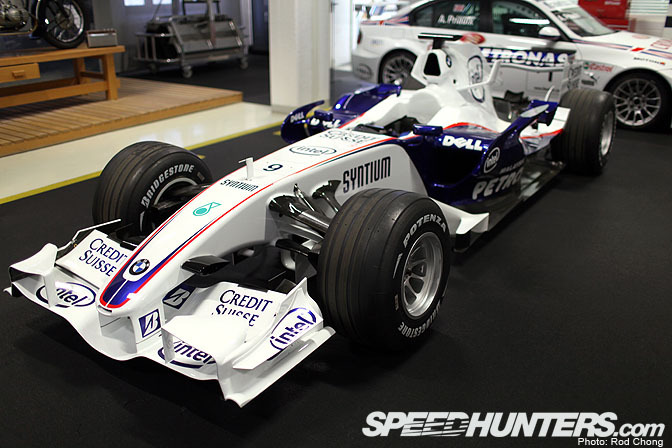 We modeled this car for several PC game mods back in my Virtual_LM days and each time incorrectly coloured the letters as blue…. they must have been reflecting the sky on the reference photos I was using. Odd. 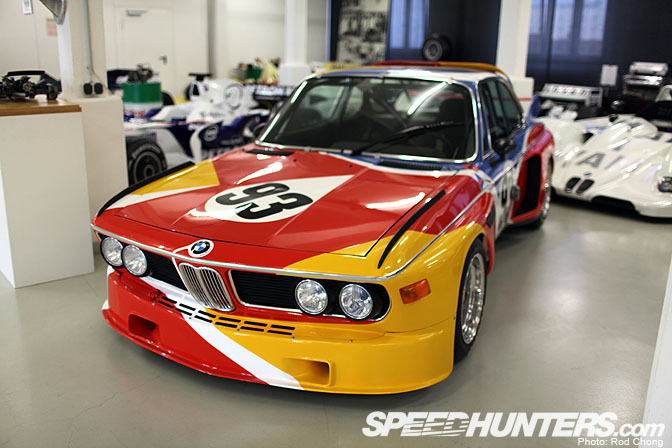 Here's the original Art Car that started the program: a competition spec CSL. 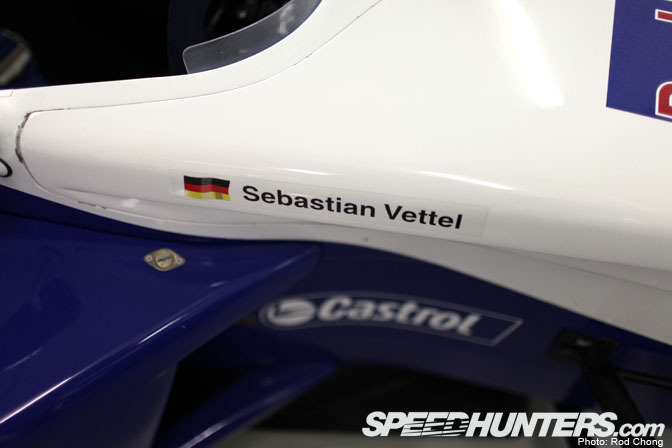 At the end of the room was this ex-Sebastian Vettel Formula BMW racer. 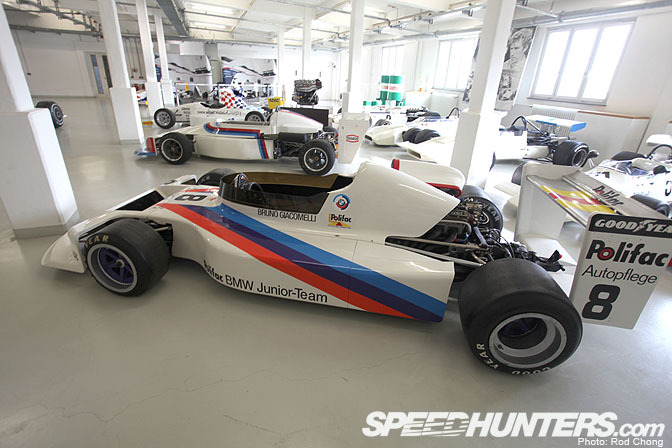 BMW must have known the kid was going somewhere when they decided to hang on to the chassis. 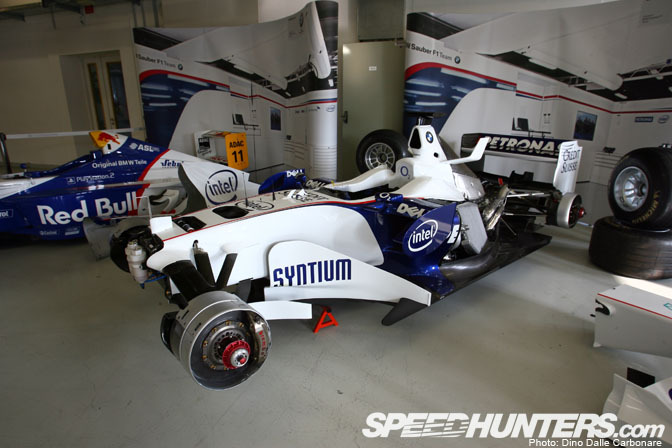 Beside it sits a partially disassembled Formula 1 car from a couple seasons back. Check out the custom shape on the radiator… wow… this is the closest I've ever gotten to such exclusive technology. Heading downstairs to the production car floor, I quickly stopped to photograph a display commemorating BMW's 1999 Le Mans victory. I was looking around Schnitzer for the trophy, but I see that it sits here in Munich! … including rare performance models. 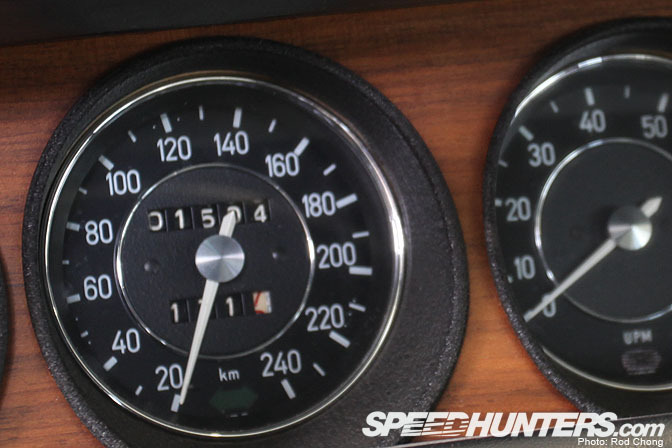 Dino and I were curious about just how mint these cars are so we started to look inside them to check out mileage. 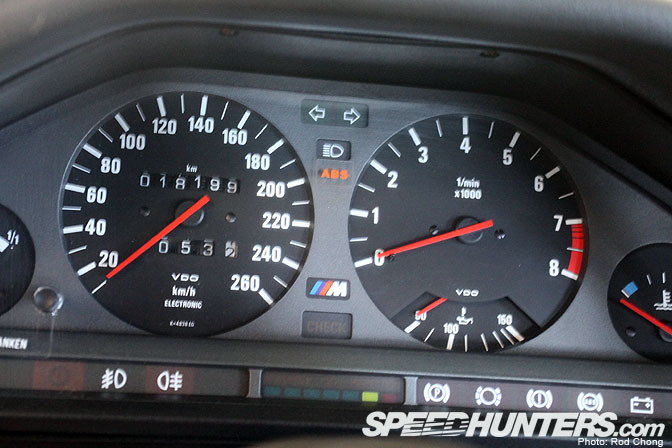 This bright red M3 has 18K kms… on it. Not crazy low bit still relatively impressive. Check out one of the original Batmobile CSLs. This is the street version of the race cars we've come to love so much. And now for the mileage…. wow…. A proper museum piece this one is. 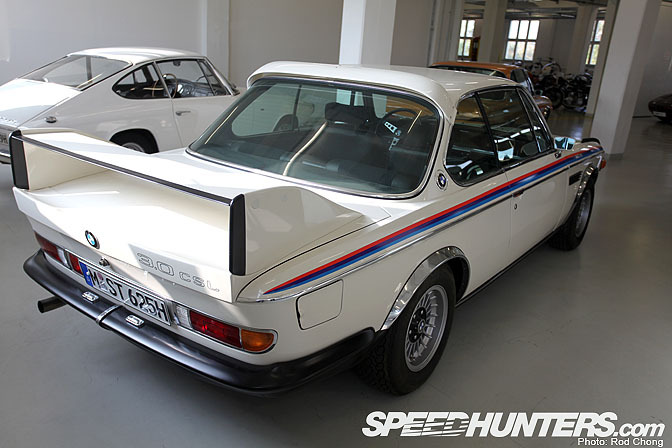 The Batmobile is actually a version two CSL. This Orange car is a the first, more subtle version. 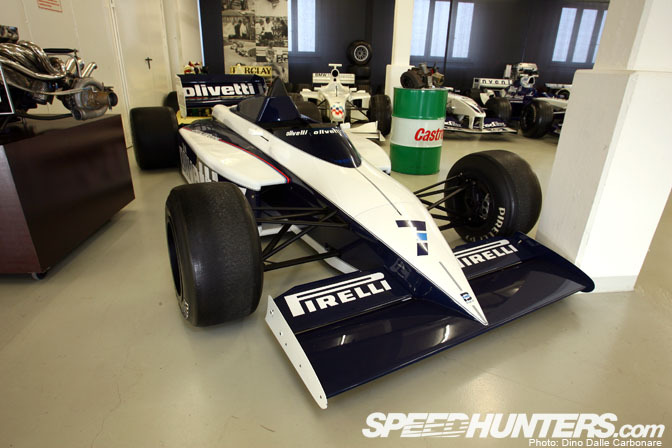 We pushed it out to the center of the room to get this shot… stunning car! Downstairs a select few race cars are on display in a banquet hall. It's possible to rent this out for your own private functions. 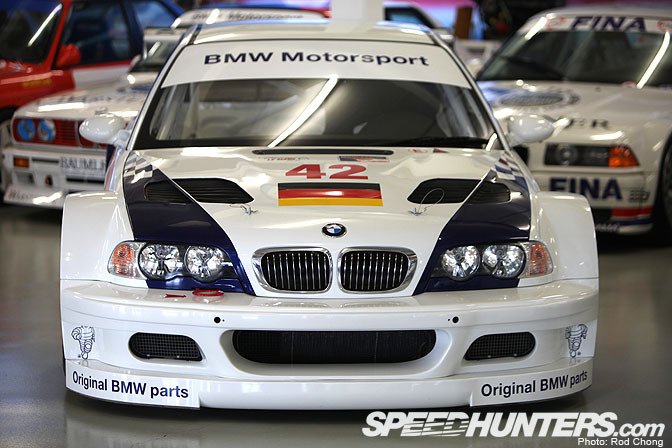 … as well as Andy Priaulx's last WTCC championship winning machine. I wonder if they've let him keep any of his old race cars. 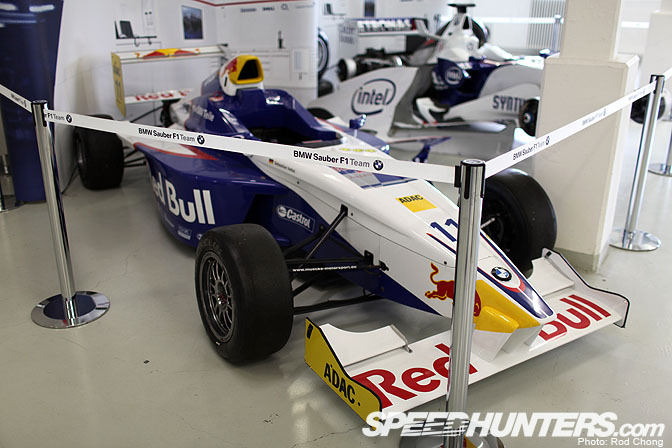 And another old DTM machine. 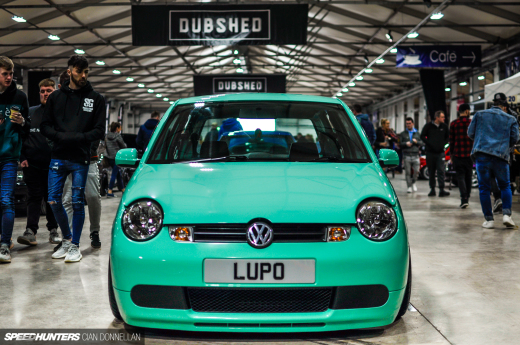 I love every aspect of this car! Behind the banquet hall are the workshops. They are used partially for working on vintage customer cars and partially for working on and restoring museum cars. This was a customer car in for servicing. 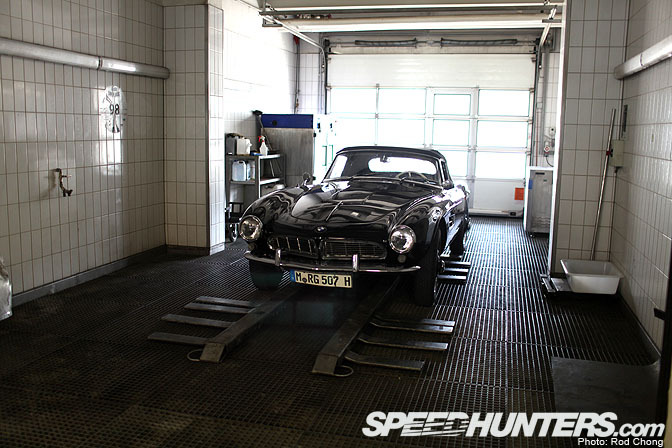 While BMW own this 507 roadster…. 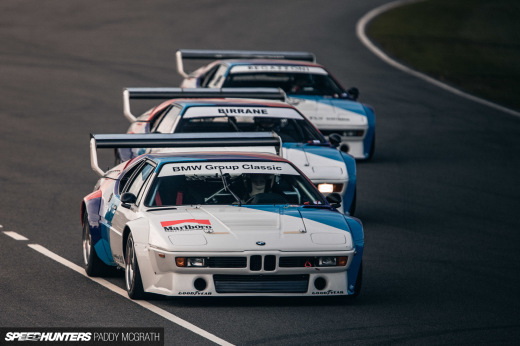 And with this article I bring BMW month to a close. 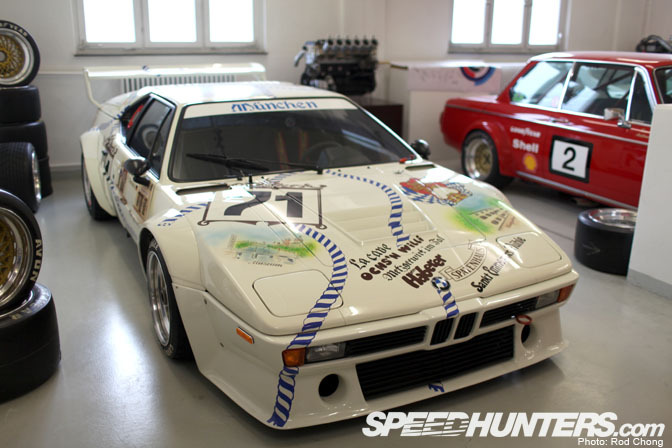 Thanks to everyone who participated in this epic month of Speedhunting! Let's get on with October now. Rod, this final edition is by far my favorite post of the month! Can we please have some more photos from the collection? So jealous,soo jealous. I would also love to see some more photos, amazing you were granted acess to this amazing magical place. 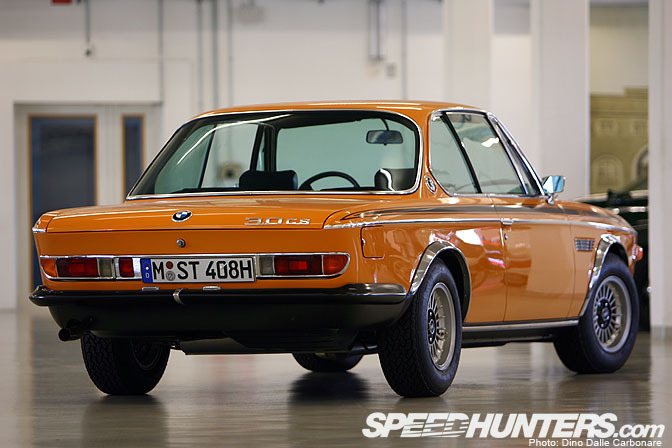 That orange 3.0....amazing, think how much that car would go for at auction! 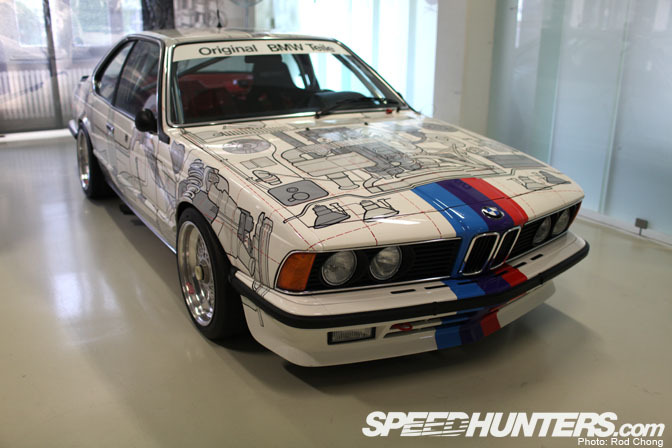 Great job again, I just wish every month was BMW month, ever think about creating an all BMW blog similar to speedhunters? I'd love to write for you! 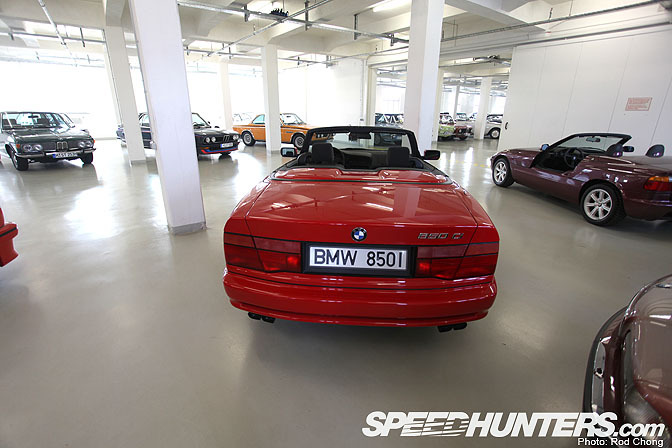 This place is like Mecca for BMW Enthusiasts around the world. Your connections must have been quite good to be allowed in with cameras as they are usually not permitted. You did a fantastic job capturing the many treasures hidden inside. Thanks for the effort, though I'm quite sure you were thrilled to do so. In a version of that image that I cropped and spliced you can see all three of the McLaren F1s that are part of this collection together. 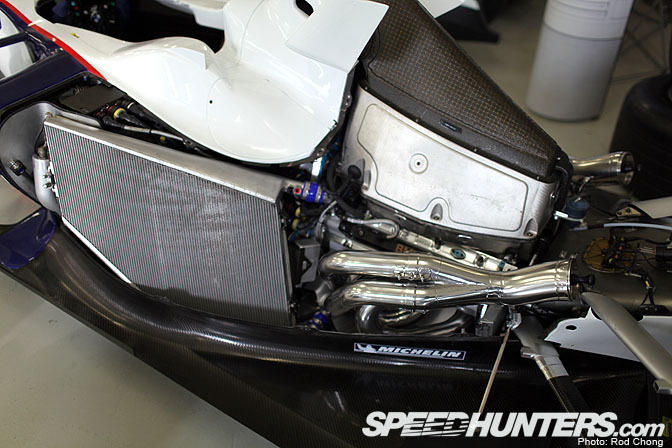 The silver road car is chassis #047. The short tailed FINA GTR is #18R and the longtail that you liked so much Rod is #26R. Thanks again for sharing! 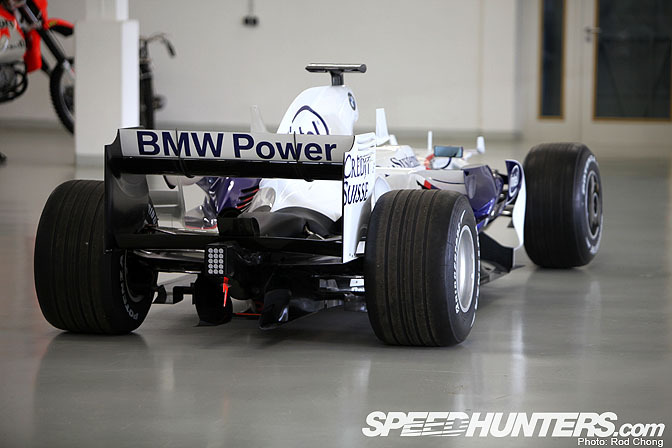 It has been a great month here at Speedhunters for this F1 enthusiast! The owner of that 507 is soooooooo lucky! 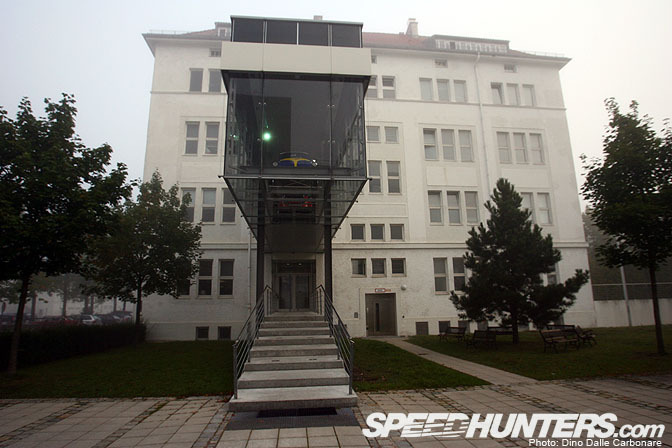 Thanks to Speedhunters I have been happy for the entire month!. What an awesome trip. Especially the retrospective and your features on the Welt, Museum and Classic Collection. Great Job guys. Can't wait for the next thematic month. That factory is my graceland. I could happily spend the rest of my life walking through there.